In my last post on Keynesian economics I outlined a simple example that I think captures the core of Keynes’s economics. It will help to understand this post if you read that one first. Where C is consumption, Y is income (and total output), and b is the fraction of income spent on consumption (the marginal propensity to consume). Which can only be true if Y=0, so the economy breaks down. Perhaps this scenario is easiest to see if we imagine the case where there is one worker and one firm. The worker works for the firm and gets paid Y. He then decides to buy bY of the output he just produced. The firm realizes he made too much stuff, so he cuts back on production. But this means he reduces his demand for the worker’s labor and cuts his hours. But now the worker makes less so he spends even less and the process continues until no production is carried out at all. The only way we could sustain production through consumption alone would be if nobody wanted to save at all. So the level of investment determines the level of income. It was through this logic that Keynes concluded that it was the “animal spirits” of firms that determined the state of the economy. It’s possible that the level of investment exactly corresponds to the full employment level of output of an economy, but there is nothing that guarantees that it will. There are still a few subtleties we need to consider. The first is the role of interest rates. In the classical view of the economy, when people try to save more, they increase the supply of loanable funds, which pushes down interest rates (think of banks having excess money to lend and the only way they can get rid of it is by lowering the interest rate). That lower interest rate then makes previously unprofitable investment projects become profitable and investment rises. If the interest rate falls enough, it’s possible that the increase in investment would be enough to offset the decrease in consumption. Keynes didn’t deny this possibility. However, he argued (I think correctly), that interest rates are certainly not the only, and likely not even the primary, factor that goes into a firms investment decision. If a firm expects demand to be low due to a recession, there is no interest rate where it will be profitable for them to make that investment. And, as we saw in the last post, by failing to make those investments, firms’ expectations become self-fulfilling and their pessimism is proven correct. Interest rate adjustments alone therefore cannot save us from a Keynesian recession. Another potential question comes from the assumptions of the Keynesian consumption function. It is obviously unrealistic to assume that each household wants to consume the same constant fraction of their income. People like Milton Friedman have argued that what people really care about when making consumption decisions is their permanent income. If my income falls today, but I expect it to return to its previous level tomorrow, I will borrow in the bad times to keep a constant level of consumption. I think this criticism is valid, but I don’t think it stops Keynes’s story. As long as aggregate consumption is less than total output (which it almost certainly will be), we still need investment to fill the gap. We still rely on expectations of firms to be correct regarding their future demand. 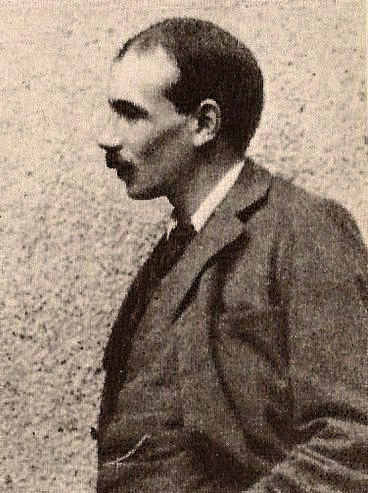 By focusing on the case where investment was exactly enough to move the economy to full employment, Keynes argued that “classical” economists implicitly restricted the economy to a special case. Keynes set out to correct that theory by proposing a “general theory” where investment fluctuated unpredictably and could (and often is) less than the level that would sustain full employment. I think this contribution is extremely valuable and unfortunately often overlooked. Even modern “New Keynesian” models bear little resemblance to the economy Keynes described. Models with money at all are rare and ones that allow the type of monetary disequilibrium in Keynes’s theory are all but nonexistent. What is Keynesian Economics about? Even if you’ve never taken an economics class you might still have some idea. The 2008 stimulus package was frequently referred to as a Keynesian policy. Government intervention and Keynesian economics often go hand and hand. If you have taken a macroeconomics class you might have an even deeper knowledge of Keynesian economics. Maybe you know about the multiplier, the Keynesian cross, the IS-LM model. And all of those are certainly related to Keynesian economics, but none really capture the heart of Keynes’s contribution. Part of the trouble with people’s understanding of Keynes’s work is that secondary sources frequently distort what he actually said. For example, if you read Mankiw’s intermediate macroeconomics textbook you will come away with the impression that Keynesian economics is about sticky prices. We get unemployment because wages don’t adjust downward quickly enough. So called “New Keynesian” models, the modern analogue to IS-LM are also predicated on slower than optimal price adjustments to shocks. It is true that Keynes assumed sticky prices for part of his analysis, but he was careful to emphasize that “The essential character of the argument is precisely the same whether or not money-wages, etc., are liable to change” (General Theory Ch. 3). So if not sticky prices or wages, what is it that causes unemployment in Keynes’s world? In my reading, Keynes’s story is all about monetary disequilibrium and a failure to coordinate savings and investment in a monetary economy. Keynes famously stated that his theory refuted “Say’s Law,” which can be simply stated as “supply creates its own demand.” Now, whether or not that’s what Say actually said remains a point of contention even today, but it’s that formulation that Keynes attempts to refute, which I think is worth exploring on it’s own. What Keynes really wants to do is draw a distinction between a barter economy and a monetary economy. I recently taught an intermediate economics class and I developed a simple example that I think helps illustrate the main points. In this kind of barter setup, Say’s law is trivially true. Any demand for bananas is supply of apples so supply creates its own demand. 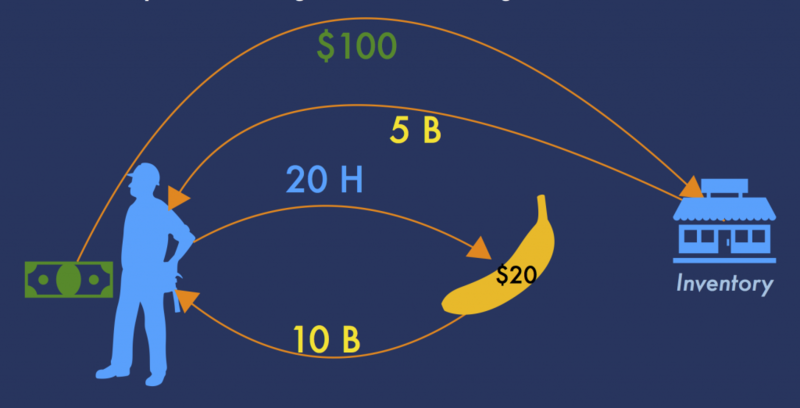 In this case, demand for bananas is $10(20) = 200 and supply is $20(10), which are obviously equal. However, when we start to add in money, the relationship between supply and demand is not as clear. For a second example we will assume now that bananas and apples cannot be directly traded. Instead, each good will have to be sold for dollars, which can then be used to purchase the other good. Of course, we could still have the exact same situation as above. If all transactions happen instantaneously and every time an apple is produced it is immediately sold and the proceeds immediately used to purchase an apple. However, now there is another possibility. Imagine that for some reason the apple producer wants to consume more bananas tomorrow than today and decides to save in dollars (I assume apples cannot be saved directly – this might be a strong assumption but it will make sense later). He still wants to consume 10 bananas (so he needs to produce 20 apples), but he also wants to save $100, so he produces an additional 10 apples (30 apples total). But what if the banana producer still only wants to buy 20 apples. He doesn’t want to pay an extra $100 for the additional 10 apples that are being produced. If you’re an economist the first question that comes to your mind should be why the price doesn’t just adjust. If demand for apples is less than supply for apples, the price of apples should fall until the market is equilibrated. So in this case, apples could fall in price to $6.67 so that 10 bananas buy 30 apples and supply equals demand again. Except then we run into a problem. After the price adjustment producer A still isn’t happy. He didn’t get to save his $100. So really this can’t be an equilibrium at all (it’s possible that the change in prices would also affect his desired saving, but as long as it’s still positive it’s still not an equilibrium). The problem with the logic above is that we are still trying to think of the economy as a barter economy with one market (trade between apples and bananas), when it is actually a monetary economy with 2 markets (money for apples and money for bananas). Finding a single equilibrium price for two markets is not enough. We need equilibrium in both markets. What we have in the example above is an excess supply of apples and an excess demand for money. The banana producer can’t supply additional money, so he is unable to help return to equilibrium. So who can help? Who supplies money? The Fed! If the Fed simply prints money to buy the excess apples we are back to equilibrium at the same prices as before. Since the worker still worked 20 hours, production of bananas didn’t fall, but demand for bananas did. The firm is forced to put the extra bananas into its inventories. Is this a problem? Maybe not. If the firm realizes that the worker will use his savings to purchase more bananas in the future, they are happy to increase their investment now in order to produce more bananas next period (an equivalent story could be told where they are building machines to increase production, but the inventory version is the simplest I think). We could then imagine a second period of this economy where the worker uses his savings from the first period to buy the bananas from the inventory in the second. This story gives us a nice equilibrium outcome with no unemployment. The worker works his desired amount in each period, saving $100 in the first to buy five additional bananas in the second. The banana producer invests in 5 extra bananas to prepare for the increase in demand in the second period. Saving and investment are perfectly coordinated. 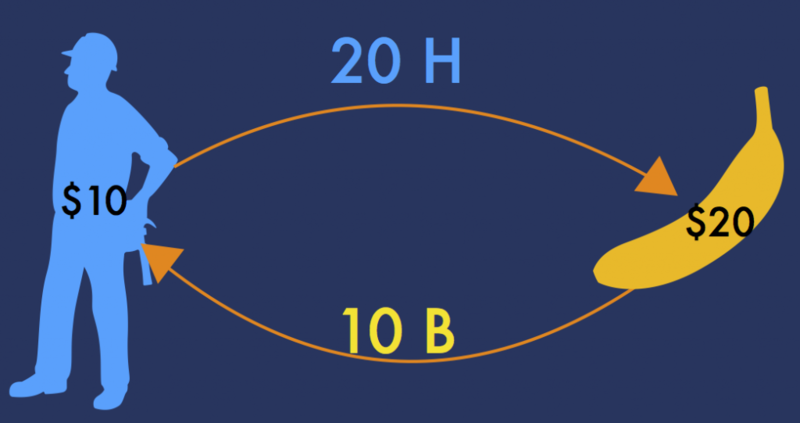 Say’s Law holds. Here the firm doesn’t expect the decline in demand today to translate into an increase in demand tomorrow. They see demand for 5 bananas today so they only hire the worker for long enough to produce those 5. The worker still wants to work 20 hours to save an additional $100, but nobody will hire him so he only works 10 and is therefore underemployed (if we think about this as representing many people we would have some employed and some unemployed). Keynes referred to this situation as involuntary unemployment. People want to work at the prevailing wage, but since firms don’t expect their consumption of their product to compensate the cost of their wages, they don’t want to hire. There are two interesting points here. First, note that wage cuts will not help. The worker wants to save regardless of his wage. Cutting it will only make him want to work more, which actually makes the problem even worse. Second, the firm’s prediction actually comes true. Since the worker was actually unable to save anything in the first period, his demand for bananas actually won’t increase in the future either. By expecting lower demand tomorrow, the firm actually caused that future to be realized. In this way, expectations are self-fulfilling and we get multiple equilibria. This example is highly stylized, but I think it demonstrates Keynes’s main point. When somebody wants to save, there is no magical process that instantly transforms their saving into investment. Investment decisions are driven primarily by firms’ expectations about demand for their own products. Without perfect foresight, they must rely on cruder measures of prediction (like animal spirits). If they don’t expect increased saving to translate into future demand, we get unemployment. I will have more to say on Keynesian economics in at least one future post (including some criticism of Keynes), but this is already getting long so I will stop here for now. The title, in case you didn’t already guess, is fake news. There was no study. But think about your reaction when you read it. Raise your hand if you said “wait a minute, I always thought fake news was a huge deal but I guess this study proved me wrong. I’ll just change my mind without thinking about it at all.” Anyone? Yeah I didn’t think so. And if you aren’t convinced by a headline on a reputable publication such as this one (OK maybe not so much), are you really buying the fake headlines that the Pope backed Trump or that Hillary actually didn’t win the popular vote? Recently there has been an uproar surrounding these fake headlines. 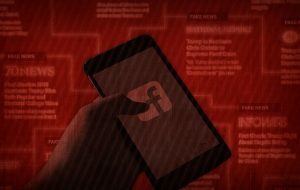 Germany wants Facebook to pay $500,000 for every fake news story that shows up. California (of course) wants to pass a law that will make sure every high school teaches its students how to spot fake news stories. I wish those stories were themselves fake news, but they appear to be all too real. Now there probably are some people who do read these fake headlines and don’t do their research. Maybe they’ll store it somewhere in the back of their mind and use it as evidence to support their positions in debates with their friends. But I suspect that the only people who believe a fake headline are ones who were already inclined to believe it before they read it. No study has been done, but I’ll make the claim anyway: Nobody changes their mind because of fake news. Perhaps more concerning is that people also don’t seem to change their mind because of real news either. They don’t let the facts guide their positions, but instead seek out the facts that support the positions they already held. Is believing a fake news story any worse than only believing the stories that confirm your preconceived inclinations? In other words, the problem is not fake news. The problem is confirmation bias. Everyone’s guilty of it. I certainly am. How could you not be? With the internet at your fingertips, evidence supporting nearly any argument is freely available. And I don’t just mean op-eds or random blog posts. Even finding academic research to support almost anything has become incredibly easy. Let’s say you want to take a stand on whether the government should provide stimulus to get out of a recession. Is government spending an effective way to restore growth? You want to let the facts guide you so you turn to the empirical literature. Maybe you start by looking at the work of Robert Barro, a Harvard scholar who has dedicated a significant portion of his research to the size of the fiscal multiplier. Based on his findings, he has argued that using government spending to combat a recession is “voodoo economics.” But then you see that Christina Romer, an equally respected economist, is much more optimistic about the effects of government spending. And then you realize that you could pick just about any number for the spending multiplier and find some paper that supports it. So you’re left with two options. You can either spend a lifetime digging into these dense academic papers, learning the methods they use, weighing the pros and cons of each of their empirical strategies, and coming to a well-reasoned conclusion about which seems the most likely to be accurate. Or you can fall back on ideology. If you’re conservative, you share Barro’s findings all over your Facebook feed. Your conservative friends see the headline and think “I knew it all along, those Obama deficits were no good,” while the liberals come along and say, “You believe Barro? His findings have been debunked. The stimulus saved the economy.” And your noble fact finding mission ends in people digging in their heels even further. That’s just one small topic in one field. There’s simply no way to have a qualified, fact-driven opinion on every topic. To take a position, you need to have a frame to view the world through. You need to be biased. And this reality means that it takes very little to convince us of things that we already want to believe. Changing your mind, even in the face of what could be considered contradictory evidence, becomes incredibly hard. I don’t have a solution, but I do have a suggestion. Stop pretending to be so smart. On every issue, no matter what you believe, you’re very likely to either be on the wrong side or have a bad argument for being on the right side. What do the facts say, you ask? It would only be a slight exaggeration to say that they can show pretty much anything you want. I’ve spent most of my time the last 5 or so years trying to learn economics. Above all else, I’ve learned two things in that time. The first is that I’m pretty confident I have no idea how the economy works. The second is something I am even more confident about: you don’t know how it works either. Part 1 in a series of posts on modern macroeconomics. This post focuses on Keynesian economics in order to set the stage for my explanation of modern macro, which will begin in part 2. If you’ve never taken a macroeconomics class, you almost certainly have no idea what macroeconomists do. Even if you have an undergraduate degree in economics, your odds of understanding modern macro probably don’t improve much (they didn’t for me at least. I had no idea what I was getting into when I entered grad school). The gap between what is taught in undergraduate macroeconomics classes and the research that is actually done by professional macroeconomists is perhaps larger than in any other field. Therefore, for those of you who made the excellent choice not to subject yourself to the horrors of a first year graduate macroeconomics sequence, I will attempt to explain in plain English (as much as possible), what modern macro is and why I think it could be better. But before getting to modern macro itself, it is important to understand what came before. Keep in mind throughout these posts that the pretense of knowledge is quite strong here. For a much better exposition that is still somewhat readable for anyone with a basic economic background, Michael De Vroey has a comprehensive book on the history of macroeconomics . I’m working through it now and it’s very good. I highly recommend it to anyone who is interested in what I say in this series of posts. Although Keynes was not the first to think about business cycles, unemployment, and other macroeconomic topics, it wouldn’t be too much of an exaggeration to say that macroeconomics as a field didn’t truly appear until Keynes published his General Theory in 1936. I admit I have not read the original book (but it’s on my list). My summary here will therefore be based on my undergraduate macro courses, which I think capture the spirit (but probably not the nuance) of Keynes. Keynesian economics begins by breaking aggregate spending (GDP) into four pieces. Private spending consists of consumption (spending by households on goods and services) and investment (spending by firms on capital). Government spending on goods and services makes up the rest of domestic spending. Finally, net exports (exports minus imports) is added to account for foreign expenditures. In a Keynesian equilibrium, spending is equal to income. Consumption is assumed to be a fraction of total income, which means that any increase in spending (like an increase in government spending) will cause an increase in consumption as well. An important implication of this setup is that increases in spending increase total income by more than the initial increase (called the multiplier effect). Assume that the government decides to build a new road that costs $1 million. This increase in expenditure immediately increases GDP by $1 million, but it also adds $1 million to the income of the people involved in building the road. Let’s say that all of these people spend 3/4 of their income and save the rest. Then consumption also increases by $750,000, which then becomes other people’s incomes, adding another $562,500, and the process continues. Some algebra shows that the initial increase of $1 million leads to an increase in GDP of $4 million. Similar results occur if the initial change came from investment or changes in taxes. The multiplier effect also works in the other direction. If businesses start to feel pessimistic about the future, they might cut back on investment. Their beliefs then become self-fulfilling as the reduction in investment causes a reduction in consumption and aggregate spending. Although the productive resources in the economy have not changed, output falls and some of these resources become underutilized. A recession occurs not because of a change in economic fundamentals, but because people’s perceptions changed for some unknown reason – Keynes’s famous “animal spirits.” Through this mechanism, workers may not be able to find a job even if they would be willing to work at the prevailing wage rate, a phenomenon known as involuntary unemployment. In most theories prior to Keynes, involuntary unemployment was impossible because the wage rate would simply adjust to clear the market. Keynes’s theory also opened the door for government intervention in the economy. If investment falls and causes unemployment, the government can replace the lost spending by increasing its own expenditure. By increasing spending during recessions and decreasing it during booms, the government can theoretically smooth the business cycle. The above description is Keynes at its most basic. I haven’t said anything about monetary policy or interest rates yet, but both of these were essential to Keynes’s analysis. Unfortunately, although The General Theory was a monumental achievement for its time and probably the most rigorous analysis of the economy that had been written, it is not exactly the most readable or even coherent theory. To capture Keynes’s ideas in a more tractable framework, J.R. Hicks and other economists developed the IS-LM model. I don’t want to give a full derivation of the IS-LM model here, but the basic idea is to model the relationship between interest rates and income. The IS (Investment-Savings) curve plots all of the points where the goods market is in equilibrium. Here we assume that investment depends negatively on interest rates (if interest rates are high, firms would rather put their money in a bank then invest in new projects). A higher interest rate then lowers investment and decreases total income through the same multiplier effect outlined above. Therefore we end up with a negative relationship between interest rates and income. The LM (Liquidity Preference-Money) curve plots all of the points where the money market is in equilibrium. Here we assume that the money supply is fixed. Money demand depends negatively on interest rates (since a higher interest rate means you would rather keep money in the bank than in your wallet) and positively on income (more cash is needed to buy stuff). Together these imply that a higher level of income results in a lower interest rate required to clear the money market. An equilibrium in the IS-LM model comes when both the money market and the goods market are in equilibrium (the point where the two lines cross). The above probably doesn’t make much sense if you haven’t seen it before. All you really need to know is that an increase in government spending or investment shifts the IS curve right, which increases both income and interest rates. If the central bank increases the money supply, the LM curve shifts right, increasing income and decreasing interest rates. Policymakers then have two powerful options to combat economic downturns. In the decades following Keynes and Hicks, the IS-LM model grew to include hundreds or thousands of equations that economists attempted to estimate econometrically, but the basic features remained in place. However, in the 1970s, the Keynesian model came under attack due to both empirical and theoretical failures. Part 2 will deal with these failures and the attempts to solve them.